Enterprise Rent-a-Car became the largest car rental company in the country, by focusing on the “niche” left vacant by Hertz and Avis – that niche being everywhere in the United States outside of a major airport. Enterprise started as being the place to rent a car at a reasonable price, without unnecessary and confusing add-ons charges (e.g. redundant car insurance), when your car was in the shop. Today privately owned Enterprise is a colossus that still dominates the ‘repair rental’ business, but also is a formidable player throughout the rental car spectrum. Hertz and Avis meanwhile, seemingly bound in golden chains to the corporate expense account customer at the airport terminal, are still watching as vast aspects of their industry changes and moves away from them. On Monday, November 6, 2017, Avis Budget Group trimmed the top end of its revenue expectations for the year and the market immediately took the stock down. 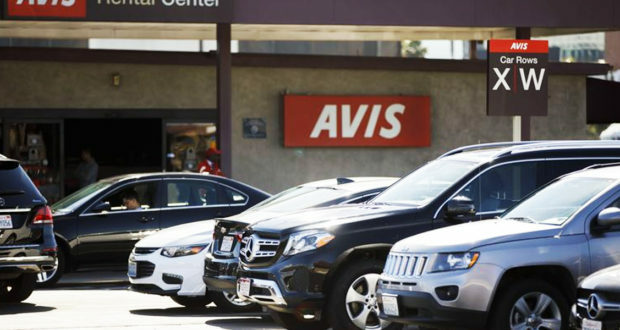 Avis now sets the high end of its revenue expectations at $8.90B down from $8.95B. and the upper end of its EBITDA expectations at $745M down from $775M. 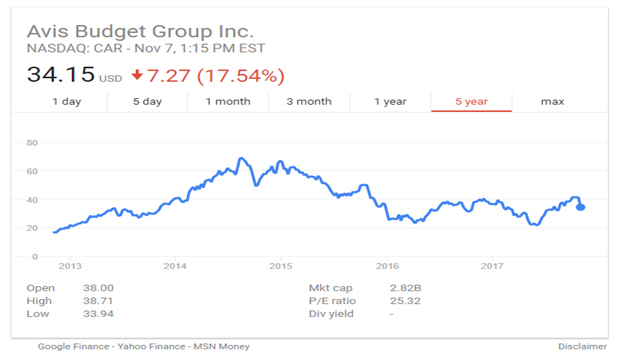 Since its recent year high of $68.89 on August 22, 2014, the stock has been cut in half as the larger market has posted records. Problems for Hertz and Avis, the traditionally dominant players in travel and leisure rental cars are well-documented. The most dramatically obvious of these problems is the new competition they face from the sudden emergence of a rideshare industry, most readily identified with the two dominant companies in that industry, Uber and Lyft. Hertz and Avis both acknowledge the power of this new industry. Hertz has actually partnered with Lyft in a few cities, but this does not seem to be blossoming into a meaningful relationship for either company. The other problem for Hertz and Avis over the past few years has been the deteriorating trend in used car prices. Hertz and Avis are among the biggest car buyers in the world. Traditionally, one of their big secrets was that they actually made good money reselling their used cars at a net profit, post depreciation and other expenses. In the last few years, that business model is no longer working the way it had in the past. Historically weak used car prices are partly due to the torpid economy of the past few years. This past quarter, however, used car prices improved, partly due to the temporary impact of Hurricanes Harvey and Irma destroying supply. This made the drop in Avis’s top line more concerning for the market. However, persistently lackluster new and used car sales over the past few years is also partly due to the changing perception of car ownership, a perception that the rideshare industry continues to change by its undeniable success. This change in consumer perspective on the use of automobiles is the most important factor that will make the reversal of fortune being experienced by Hertz and Avis a long term reality. For the foreseeable future, Hertz and Avis should be able to retain a healthy core business serving business travelers on corporate expense accounts. These travelers are generally at least equally concerned with time saving, convenience, and brand power as they are with price. Prime physical locations of cars and customer service desks at the airport matter to these customers. Harried and pre-occupied, they tend not to scrutinize the unnecessary added features that pad the rental car company’s bottom line. And expensive national advertising campaigns resonate with risk averse corporate managers approving vendors and negotiating group rates for large organizations. However, as it stands now, the market is adamant that Avis has too many of the wrong things – such as fixed costs, and not enough of the right things – such as new profit centers and customers. The market is also adamant that it does not see Avis’s current strategy as a road to regain lost market value. Avis’s management may not believe that such a road exists. Over the past few years, the company has been increasingly buying back its own shares, using available cash to support share prices and reduce its equity base.